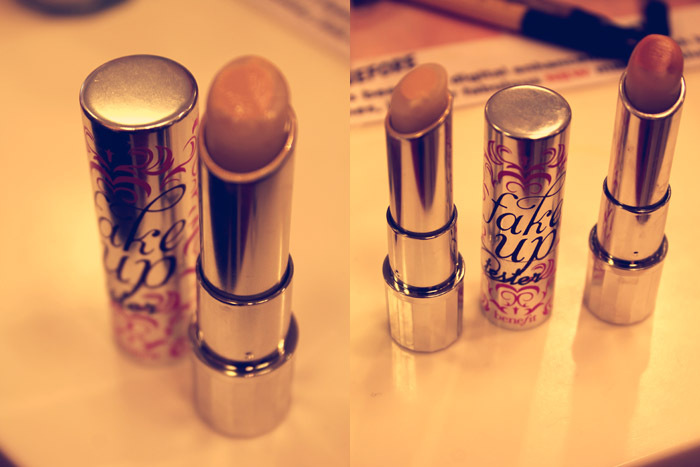 On Wednesday afternoon the Benefit in Debenhams in Bournemouth held a little gathering for bloggers, to launch Fake Up – a new hydrating concealer that’s big news for Benefit and has already been a runaway success in America, with stocks of the product selling out here and across the pond. 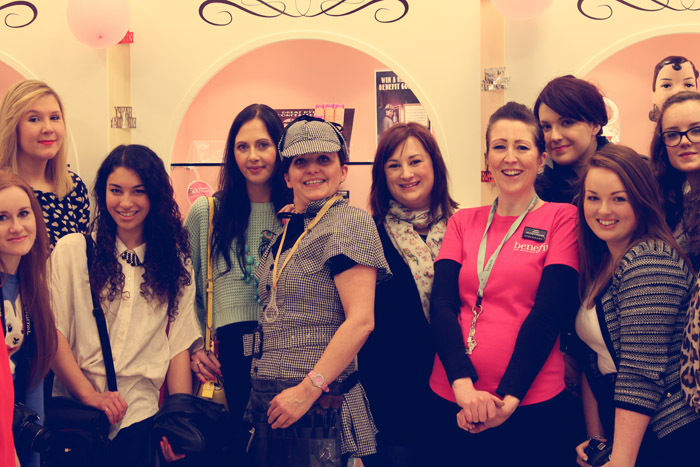 We all gathered around the Benefit counter and met Alyson, Benefit’s Event Coordinator for the South West. 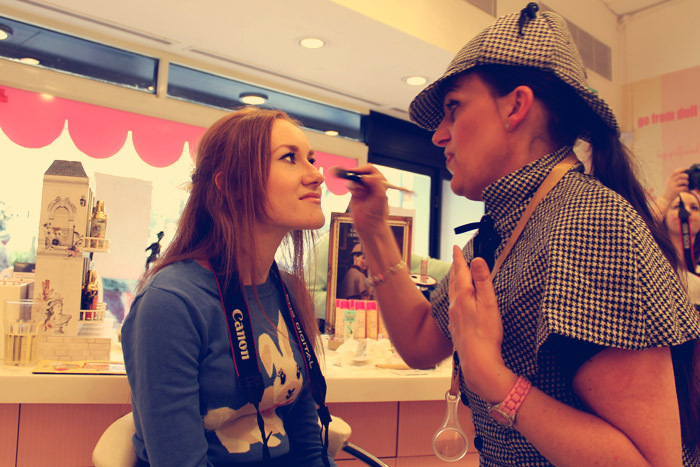 Alyson had gamely donned the ‘Sherlock Holmes-esque’ outfit that’s part of the advertising for the launch of Fake Up. We were given an introduction to Fake Up and how Benefit develop their products, which was really interesting – Fake Up has been in development for five years whilst they worked to produce a concealer that met all the requirements; it had to be non-creasing, moisturising, and have staying power, and then had to go through extensive product testing by their panel of testers (how do I get that job?). During Alyson’s introduction we were also given glasses of wine and mini cakes, which is always a little treat at events! 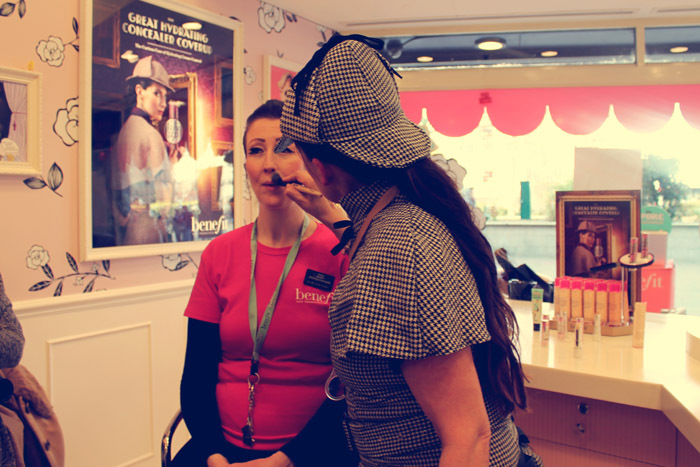 Alyson demonstrated the product and its many uses on Sophie, the manager of the Benefit Boutique here in Bournemouth. We’re really lucky in that our Benefit not only has a huge product range but also has a brow bar and does lashes, tanning and waxing – hence its Boutique title. Alyson showed us how to use Fake Up as a concealer under the eyes, to highlight eyebrows, and even used the darker shades for contouring, illustrating just what a versatile product it is. We were then all matched to our shade (of the three) of Fake Up and shown how it could work for us. 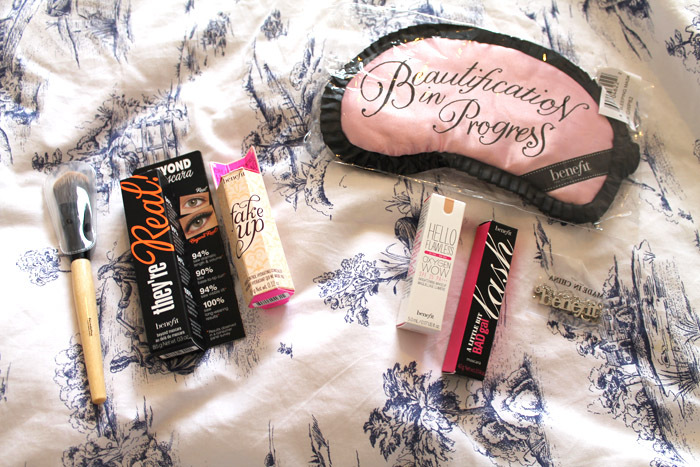 The last time I went to the Benefit counter to have a product demonstration (Fine One One) I was wearing lots of make up and felt a bit disappointed that I couldn’t fully see the results, so this time I didn’t wear any makeup, though I did feel hugely self-conscious when I turned up and everyone’s makeup looked flawless. To be honest I am still learning about which makeup is right for me and how to use it effectively so I thought it would be more helpful to go au naturel! I was so impressed with the product and how moisturising and soft it felt on my skin. It looked so dewy and fresh and made my skin look younger which is a pleasant bonus! After we’d all been shown Fake Up we were then matched to a shade of Hello Flawless Oxygen Wow and given a little sample to take away. I’ve not tried their foundation before but I’ve been trying to wear a lighter coverage foundation than Estee Lauder Double Wear so I’m hoping this will be a good replacement. Here are some of the ladies that were in attendance – I was on the left next to Georgie but my wide angle lens wasn’t quite wide enough! All in all it was a fun time and so nice to see lots of familiar faces and meet some new ones. A big thankyou to Benefit for hosting us and for the vino, cakes and goodies!